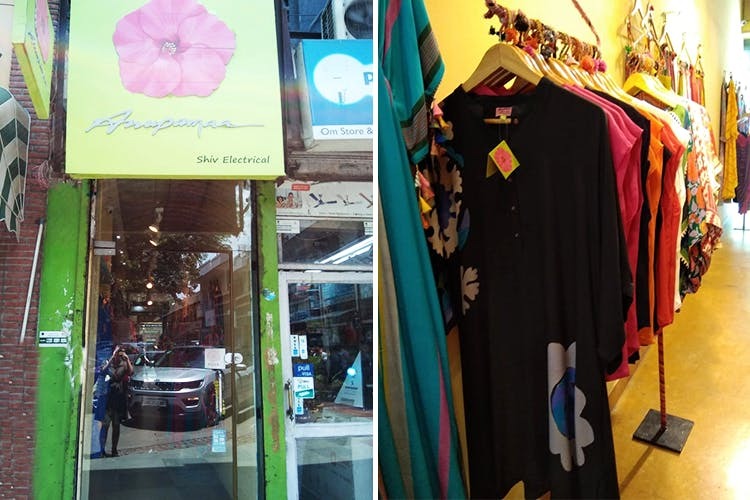 Anupamaa by Anupama Dayal is a lovely, thin corridor of a shop in Khan Market that does colourful women's kurtas, dupattas, dresses, shirts and more. That it's SO full of colour. If you're somebody who likes vibrant hues and doesn't mind investing in a quality piece, Anupamaa will be up your street. While she has couple of other stores in the city as well as an online portal, it's her original Khan store that's our favourite. A skinny little corridor of a shop with printed dresses, pop-hued shirts, and kurtas splashed with crazy prints, Anupamaa is great for colour lovers. While things tend to be priced on the higher side of things, they are enduring pieces that make up for it with their longevity (or so our reference shoppers tell us). When we checked out the store earlier this week, the dresses—screaming with shades like fuchsia and pop periwinkle blue—were what held our attention. Check this store out for a statement piece you're okay with investing in. It's on the more expensive side, so that's always something that could be better.